This is one of my favourite feeders for photographing birds. I have some unique shots of birds eating from the "sunflower". 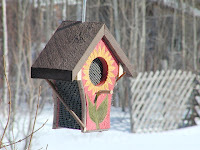 The 4 sided design allows even more birds to feed at the same time. The largest of our feeders.